Celebrate the end of Bike Month with cycling friends from across the region! 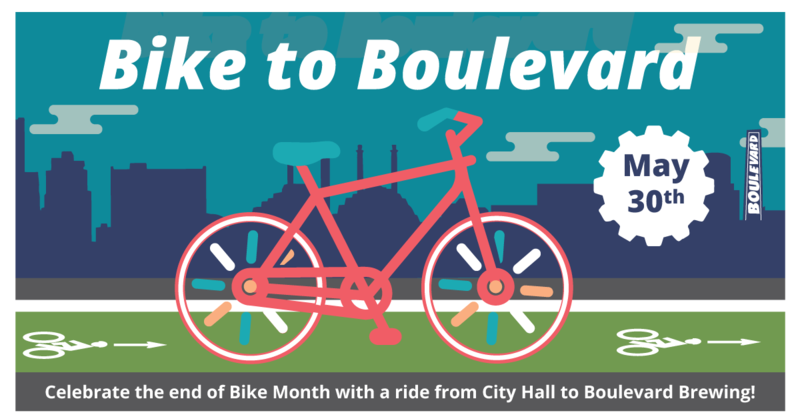 Let’s gather at KCMO City Hall for an update on the Bike Plan, and then ride together to Boulevard Tours & Recreation Center for great food, drink, and comraderie. We’re celebrating our amazing members with a party at Boulevard! Don’t have a bike? We’ll have BCycles available for you to borrow! We will provide ample bike parking at Boulevard Tours & Rec, and there is a BCycle station on-property as well. BikeWalkKC members get great deals that day, including 20% off in the Boulevard gift shop, 50% off your first full pour, and 100% of all Ginger Radler proceeds benefit BikeWalkKC. We’ll have raffle with great prizes and plenty of fun for all.